How do I email visitors with a copy of their Legal Agreement and visit details? 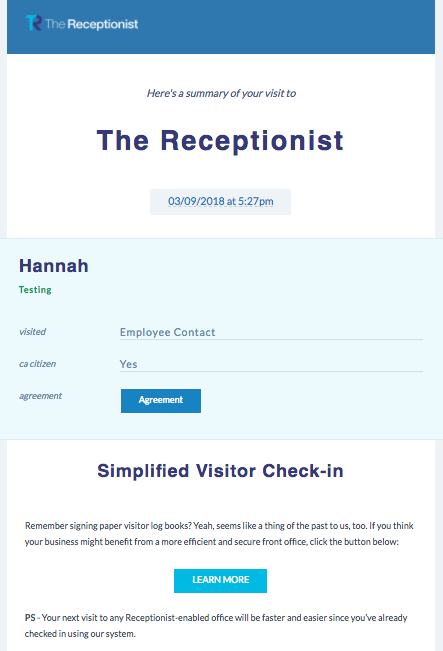 When you want to send visitors a copy of the Legal Agreement they signed and thank them for their visit to your office, you can turn on an automatic visitor summary email. You'll find this feature within your check in button settings. Click the 'edit' option next to your check in button and scroll ALL the way to the bottom to enable this feature. Under Visitor Features, click on Summary Email and save your button.